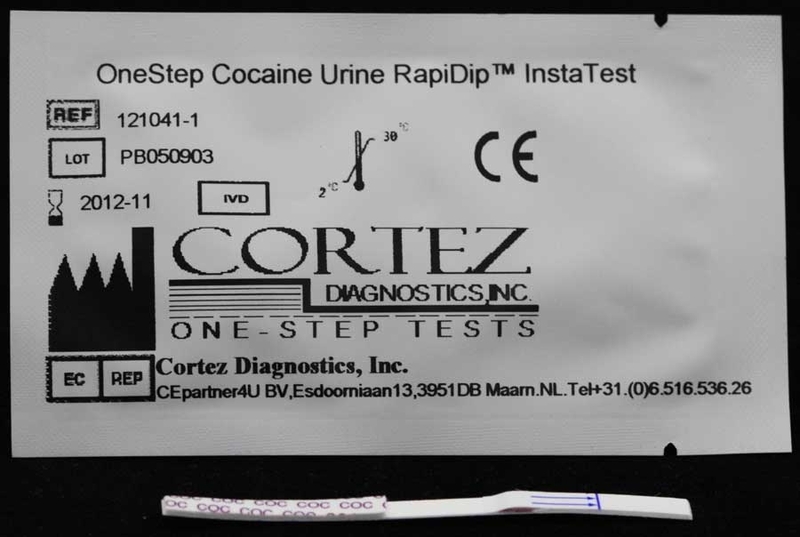 Los Angeles based Diagnostic Automation/Cortez Diagnostics, Inc., provider of high-end rapid diagnostic tests, offers a 3-panel Drug Test for Barbiturate (BAR), Methadone (MTD), and Phencyclidine (PCP) drugs. The drug testing kits we create are designed for qualitative determination of drug substances in human urine specimen. 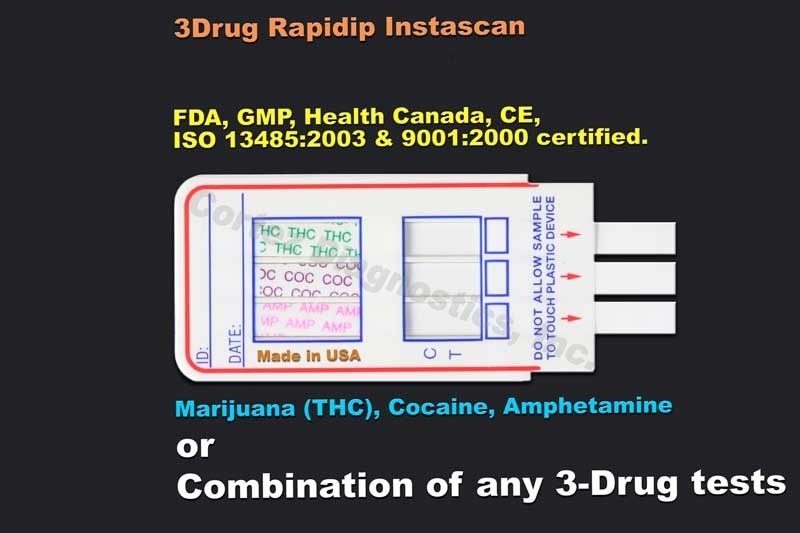 The three panel drug test- Barbiturate, Methadone, and Phencyclidine Drug Testing device is based on the principle of specific immunochemical reaction between antibodies and antigens to analyze particular compounds in human urine specimen. The assay relies on the competition for binding antibody between drug conjugate and free drug which may be present in the urine specimen being tested. When the Barbiturate, Methadone, or Phencyclidine drug is present in the urine specimen, it competes with drug conjugate for the limited amount of antibody-dye conjugate. When the amount of the barbiturate, methadone, or phencyclidine drug is equal or more than the cut-off, it will prevent the binding of drug conjugate to the antibody. Therefore, a positive urine specimen on the 3-panel drug test - Barbiturate, Methadone, and Phencyclidine Drug Test will not show a colored band on the test line zone, indicating a positive result, while the presence of a colored band indicates a negative result. A control line is present in the test window to work as procedural control. 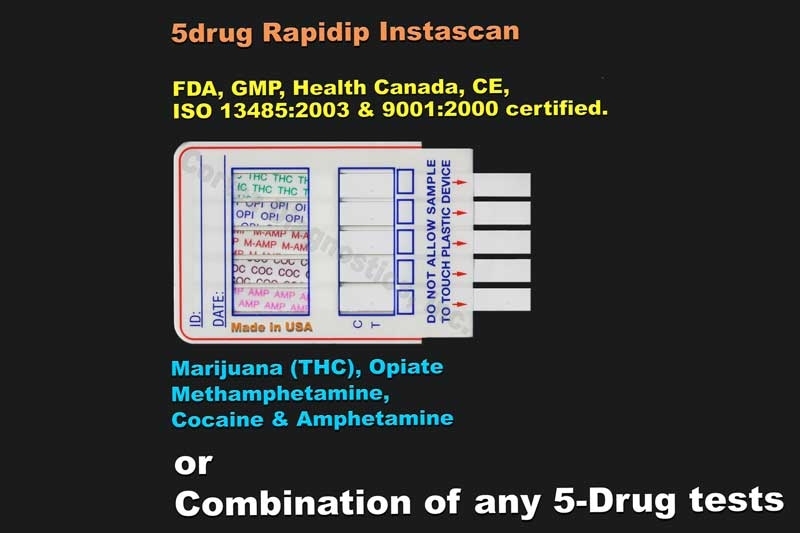 This colored band should always appear on the control line zone if the 3-panel drug test - barbiturate, methadone, and phencyclidine drug testing device is stored in good condition and the 3 panel drug test - barbiturate, methadone, and phencyclidine drug test is performed appropriately. Barbiturates (BAR) are a group of prescription drugs that are frequently abused. Barbiturate drugs can depress the central nervous system. Acute higher doses of barbiturate drugs induce exhilaration, sedation and respiratory depression. More acute responses to barbiturate drugs produce respiratory collapse and coma. The effects of short-acting barbiturate drugs, such as secobarbital last 3 to 6 hours. The effects of long-acting barbiturate drugs such as phenobarbital last 10 to 20 hours. Short-acting barbiturate drugs normally remain detectable in urine for 4 to 6 days, while long-acting barbiturate drugs can be detected for up to 30 days. Barbiturate drugs are excreted in the urine in unchanged forms, hydroxylated derivatives, carboxylated derivatives and glucuronide conjugates.Methadone (MTD) is a synthetic opioid, clinically available. The methadone drug is used clinically for the treatment of severe pain and in maintenance programs for morphine and heroin addicts. The Methadone drug acts on the central nervous and cardiovascular systems to produce respiratory and circulatory depression. The Methadone drug also produces miosis and increases the tone of smooth muscle in the lower gastrointestinal tract while decreasing the amplitude of contractions. Acute higher doses of the methadone drug induce analgesia, sedation, respiratory depression and coma. After methadone administration, the major urinary excretion products are methadone and its metabolites, EDDP and EMDP. Large individual variations in the urine excretion of the methadone drug are output of methadone from 5-22%. Typically, following a 5 mg oral dose, the methadone drug and EDDP account for 5% of the dose in the 24-hour urine. In those individuals on maintenance therapy, the methadone drug may account for 5 to 50% of the dose in the 24-hour urine and EDDP may account for 3 to 25% of the dose.Phencyclidine, commonly known as PCP, is an hallucinogen drug which interacts with dopamine, cholinergic and adrenergic systems. The PCP drug has dose dependent stimulant, depressant, hallucinogenic and psychological effects. The PCP drug is mostly ingested orally or intravenously. Even moderate amounts of the PCP drug, from 5 to 100 ng/ml, can result in psychotic, violent and self-destructive behavior. At high doses, from 100 to 500 ng/ml, the PCP drug can cause convulsions, hypertension, prolonged coma, absent peripheral sensation, and even death. The PCP drug is metabolized via hydroxylation, oxidation, and conjugation with glucuronic acid in the liver. About 10% of the PCP drug dose is excreted in urine as unchanged PCP drug. For chronic users, the PCP drug can be detected in the urine for 7 to 8 days after drug ingestion. 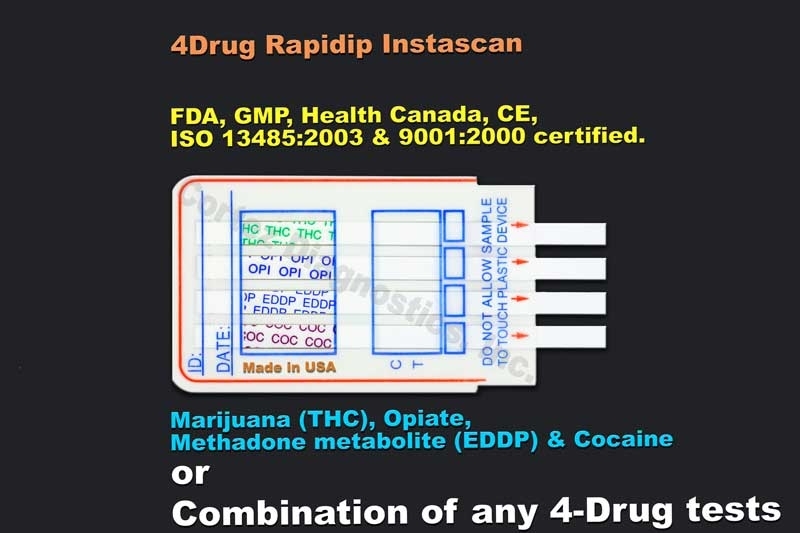 The multi drug test kit Barbiturate (BAR), Methadone (MTD), and Phencyclidine (PCP) Drug Test provides only a preliminary analytical test result. A more specific alternative chemical method must be used in order to obtain a confirmed analytical result. Gas chromatography/ mass spectrometry (GC/MS) has been established as the preferred confirmatory method by the Substance Abuse Mental Health Services Administration (SAMHSA). Clinical consideration and professional judgment should be applied to any drug of abuse test result, particularly when preliminary positive results are indicated. The optional built-in Adulteration Test is for validation of urine specimenâ€™s integrity and must not be used for In Vitro diagnostic use. 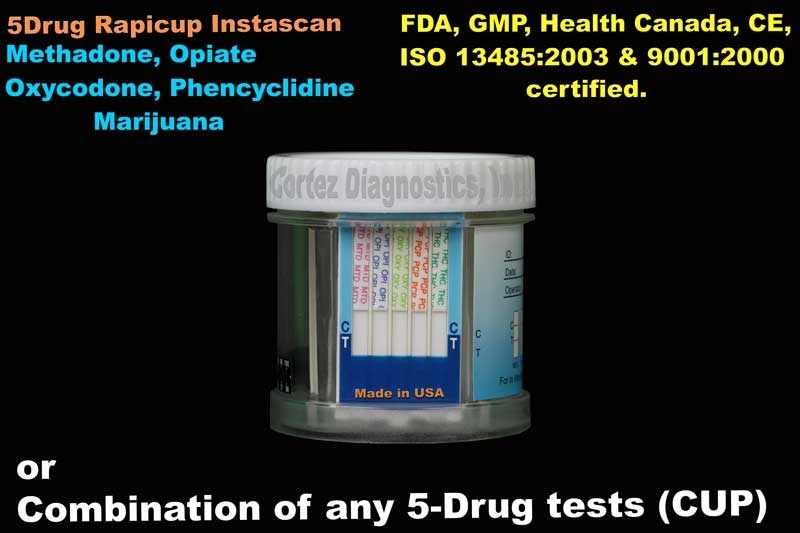 The cutoff level for this 3-panel drug test - Barbiturate (BAR), Methadone (MTD), and Phencyclidine Drug Test is 300 ng/ml of secobarbital, 300 ng/ml of methadone, and 25 ng/ml of phencyclidine. For customized cutoff level barbiturate, methadone, and phencyclidine drug tests, please contact Customer Service. 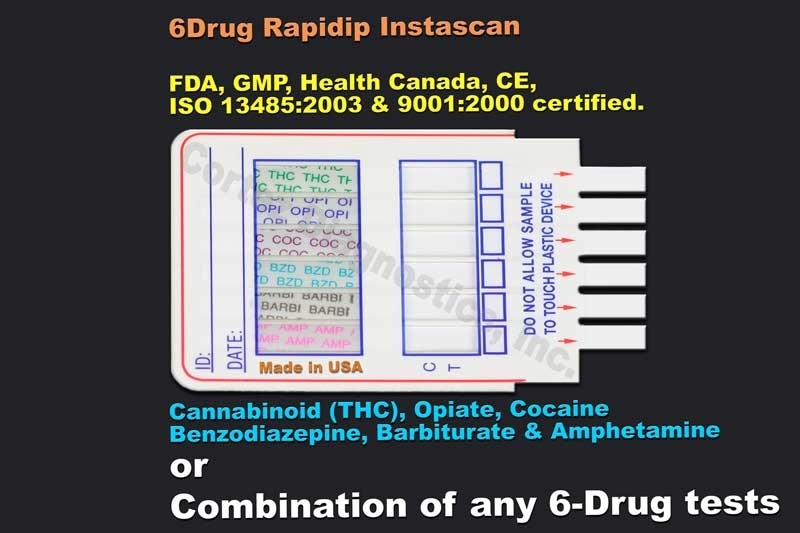 This multi panel drug test - Barbiturate (BAR), Methadone (MTD), and Phencyclidine (PCP) Drug Test is also available in cassette or strip format.